The above questions were all submitted as part of the 21 Days of Questions, 365 Days of Action domestic violence campaign. 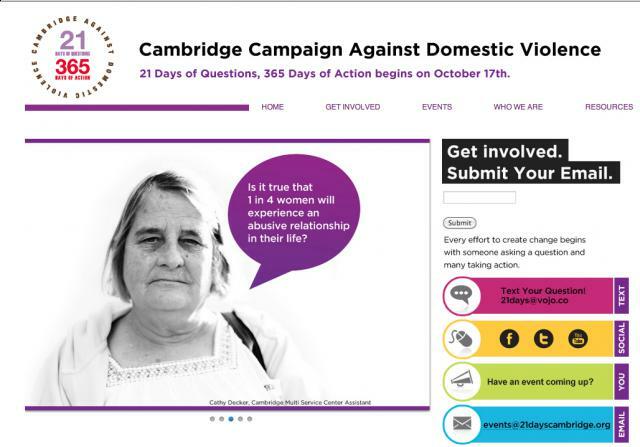 On October 17th, 2012, the City of Cambridge launched an innovative public awareness campaign against domestic violence. Through resident organizing, cultural events, discussion groups, public service announcements, social media, drop boxes, tabling, flyers, and billboards, the campaign encouraged Cambridge residents and community members to ask questions they had about the issue of domestic violence. Aside from submitting hand-written questions to ambassadors of the campaign, people could also text, e-mail, or phone in their questions using vojo.co, a micro-blogging platform. The hope in using this type of technology was to capture more questions and give people the opportunity to submit in a way that was comfortable to them. Members of the core planning team manually inputted the questions on to the vojo site, which were submitted on hand-written cards. There are two especially novel components to the 21 Days of Questions, 365 Days of Action campaign: 1) It uses technology to actually engage constituents in domestic violence problem-solving and 2) Its aim is to involve those who do not normally think about domestic violence in the movement. This research presents a case study of the 21 Days of Questions, 365 Days of Action. Because this effort has been sixteen years in the making and is a continuing process, the study focuses specifically on the time between the campaign launch on October 17th and the question review event on November 29th. Through participant observation and key-informant interviews with campaign managers, I was able to track the outcomes of critical events, gain insights about the process thus far and document hopes for moving forward. You can read the full case-study here.